However, whatever choice we make, to harm or heal, it is never the words themselves directly causing the outcome. Words, simply ‘are’. It is how we use and what we bring or associate with them, creating the end result. Most of us will have experienced the effects of the negative power of the spoken word. It can color our personal lives and ripple far beyond us to effect everything and everybody. That is why Ten Tips on the Using the Positive Power of the Spoken Word is vital. Try these Ten Tips on Using the Positive Power of the Spoken Word and see for yourself. Practice Compliments: Give unasked for praise for an action or some quality you genuinely admire in another person. Give it without reservation or a ‘rider’ attached. (A rider undoes or qualifies the compliment, robbing it of its power. Example: ‘That dress looks nice on you. It makes you look smaller.’) A true compliment is a gift. It says to the receiver you see and appreciate them for who they are and comes without strings attached. It is given freely. Read Aloud to a Child: Choose a story-book to share. Settle in and enjoy yourself. Reading aloud to a child has many positive benefits. For the child it will help develop reading skills and imagination but most importantly, it is a gift of your time and energy. It says you are valuable and worthy of my attention. For you, the reader, the quality of your relationship is enhanced. Practice Positive Self-talk: As you go about your day’s activities be conscious of how you are talking to yourself in your mind. Find aspects you can genuinely positively comment on. Be specific. The more specific you are the less likely you will counter your positive comment with a negative rejoinder. Practice graciously accepting your own compliments. Make a list of Positive Power Words or Positive Inspirational Phrases: Write them out. Post them where you will see them. Say them out loud. Practice Responding rather than Reacting: The difference? To react is to speak without thought or to blurt. To respond implies conscious thought. In responding, we make a choice. We think before we open our mouths. To help create the space needed for conscious speech, count to 5 before speaking. This may seem odd but in an emotionally charged situation, the wait gives us time to consider what it is we really want to say. Learn to say,’I’m sorry.’ The quicker we own our mistakes and acknowledge the effect they’ve had on others, the less likely they are to turn into raging monsters with a life of their own. ‘I’m sorry’, genuinely said is one of the most important of the ten tips on using the positive power of the spoken word. 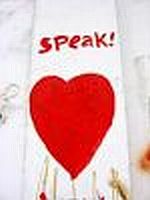 Learn to say and receive, ‘I forgive you.’ If we accept or give a sincere apology, the sting of the offence is removed. Sometimes we carry blame, guilt, or anxiety for years because we assume the hurt caused by our actions lives on. If we’d been told we were forgiven, the burden would have been released. Like ‘I’m Sorry’, ‘I forgive you’ is a top ranked tip from the ten tips on using the positive power of the spoken word collection. Collect New Words: The more words you have in your vocabulary, the more precisely you can express yourself. Listen to Inspiring Literature read by expert readers. Get audio books for your car or ipod. Fill your mind with positivity expressed in the best of language. Practice expressing genuine gratitude for all the good in your life. Thank-you is simple to say. Thank-you for reading Ten Tips on using the Postive Power of the Spoken Word. May all the words you give and receive be good ones.